In addition to our general practice, we also offer additional services for other practices, providing expertise for complex and difficult cases. I just wanted to write a note of thanks to yourself, Becky, and all of your staff for the amazing treatment and care provided to our dog, Kasper, recently. We were so impressed with your service. To be able to bring our dog to you in the morning and have an examination, investigations and surgical treatment all within the day, therefore needing just the one general anaesthetic, was really convenient for us and much less stressful for Kasper. The considerable amount of time you spent with us, both before and after Kasper’s treatment, meant that we completely understood all of the possible issues, options and outcomes and also how we might best manage Kasper in the future. Becky also telephoned us the day after Kasper’s surgery to check he was ok and we spoke again two weeks later. If only human patients got that much attention after hospital treatment! Kasper is now like a new dog. There is absolutely no sign of lameness and he is now back to being a one year old active and happy dog again. It is such a relief! I would be delighted for you to pass on our comments to anyone considering using your service - we cannot recommend you highly enough! I have nothing but good to say about our dog, Meg's stay with you, and in spite of all the worry about our precious dog, I'm sure she would say the same were she in a position to do so. She is now doing well and much enjoys her swims in our local river. I said on the form how good it was of you to contact us at home, and so reassuring to know we could contact you any time if necessary. 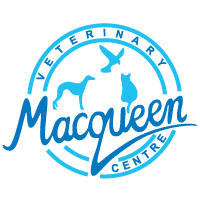 Macqueen's practice is 100% dedicated to the care of animals entrusted to them. They are all treated as if they belong to them, nothing is too much trouble. We have a crazy Springer spaniel, Dave. Ian’s treatment and care for him is second to none. If you need advice or reassurance a phone call or e-mail is all it takes. Dave has tested Ian’s skills on many occasions but always had a successful outcome. Ian is never too proud to ask for someone else’s advice. Ian, Jacky and the whole team are just superb, thank you for everything you have done. Ralphie came in in 2017 and had his first hip done, this transformed him and he was so much happier and able to be much more active than he was before. However he also needed his other hip doing so he was back in 2018 to have the opposite side done. As soon as he got home he decided he was completely fixed, the only difficulty we have had with him is keeping him subdued whilst he recovered! He is now a completely different dog, he could not be happier and can now keep up with our black Labrador and have a proper play fight with him! He thoroughly enjoyed his stays at Macqueen Vets, the whole team loved him. We cannot thank Ian & everyone at Macqueen Vets enough for giving Ralphie a new lease of life, we still cannot come to terms with how different his behaviour to life is now, he’s only had 4 years on this earth and they must have been the most painful for him, now he can live the rest of his days chasing his ball pain-free. We have always said that Macqueen's is an excellent veterinary practice, originally recommended to us by an animal physio when Beau was very young. Ian and his staff have always been extremely caring and attentive to our lovely Labrador, and we doubt anywhere could match this. Having had two very major operations (elbow replacements in his two front legs with just 5 months in between) Beau has recovered extremely well and, thanks to Ian, can now walk nearly normally. We would like to thank Ian and all at Macqueen's for looking after Beau so well. We would have no hesitation in recommending the Practice to anyone.